[center][img]https://78.media.tumblr.com/4a1f67a7d33a99fef1c4a37ba9adc024/tumblr_pd7nh6XmWR1w8xmhzo1_1280.jpg[/img][/center] [center][font=Times New Roman][size=5]These dragons are known for their ability to read the stars and to carry the weight of their futures and decisions that are or will be as magnificent as the stars they reflect. As for their personalities well those are dependent solely upon themselves and not always affected by the stars they reflect. They may be shy and yet have a bright orange opal coloration with a blazing star as their alignment, maybe they have a soft blue opal coloration with a dwarf star alignment but they have a outgoing personality. The same can be said for their fighting styles, it may or may not replicate that of the astrological alignment. These dragons are known for their ability to read the stars and to carry the weight of their futures and decisions that are or will be as magnificent as the stars they reflect. As for their personalities well those are dependent solely upon themselves and not always affected by the stars they reflect. They may be shy and yet have a bright orange opal coloration with a blazing star as their alignment, maybe they have a soft blue opal coloration with a dwarf star alignment but they have a outgoing personality. The same can be said for their fighting styles, it may or may not replicate that of the astrological alignment. The main breeds of this subspecies are dragons of all types known to Sornieth which all of course have the signature genes or colors of their variant. Meanwhile as some breeds are as of yet unknown to rest of Sornieth as some scholar suggest these currently unknown breeds will be added as they are discovered. Otherwise these dragons are known to come from all across Sorneith and have all different color eyes signature to each flight. As for their variants those may come in many kinds both known & unknown to Sorneith! These dragons known as Mysterious stars are due to their dark midnight wings and bodies and colorful tertiarys. The stars they reflect are often unknown, not yet mapped or distinguished amongst the other stars in the sky this leaves many myths or legends revolving around their meaning. Most of these stories vary depending on where the dragon came from or where the dragon is, a ice dragon might say these dragons have destinys or tales worthy of being written in their stars while a earth dragon may believe a dragon with stars unknown are souls of long forgotten dragons of the past. To have one of these special dragons in your clan might mean the greatest of joys or the worst of curses! A moonless night dragon is well known to be mistakenly bumped into in the night skies, this is so because of the dragons dark colors and no real well to differentiate it from the rest of the night sky apart from movement. So occasionally when a dragon of this variant flies through the skies over Sornieth during the night other dragons might fly right into them on accident, these incidents rarely result in serious injuries though a fall from the sky is always dangerous. The zodiac variants are an embodiment of the well known constellations seen at certain times of the year. Though theses dragons are known for their connection to the stars they don’t always have the colors of the dark night sky they often show the colors of their zodiac, these colors may often vary as different parts of sorneith see different colors as different zodiacs than another group may know. But despite the many colors a zodiac dragon is known to have the real distinction is their astral reflections. In the skies above Sornieth the shine of distant planets can observed but closer yet and the planetary dragons that can be found across Sornieth. Though they are more common these planetary dragons have full colorful wings and bodies and are recognized for their shine like the planets above. A comet is a dragon with any color body but has both dark wings and a dark belly to match. Because of these markings these dragons are seen like comets across the dawn, dusk, and night skies. Although these dragons are known for colors their personalities vary just as any other dragons and they usually are quite unique in their own way. Imperials are a magnificent example of this subspecies as they are massive dragons that when you approach them their connection to the skies becomes obvious. Though this might be true most clans fortunate to have an imperial of this subspecies are often not to be forgotten due to their unforgettable experiences and connections, this makes them valuable in their own right as individuals and as friends. 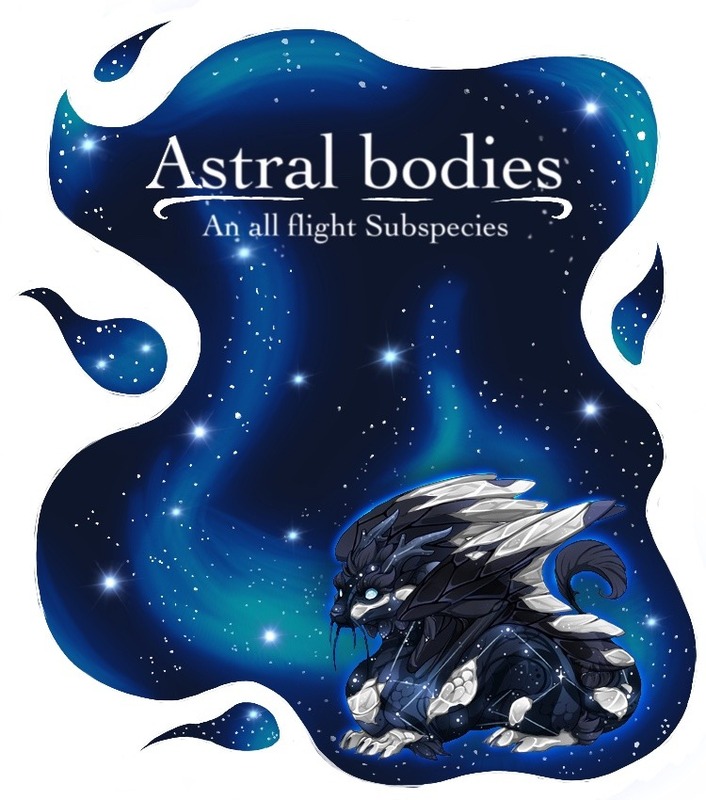 Coatls are more of the lesser known Astral bodies as they are fire dragons by creation and can often be mistaken for being stars born of the flame rather than astrologically connected dragons. This is more so due to the environment of which coatls naturally live. Though you don’t really see them I assure you they have value to those who care for them and want to see them meet their destinies. Wildclaws are one of the well known Astrological bodies and they are often remembered for their ability to change others lives. Not to mention they are known for traveling about wether alone or in a group to do a great manner of things, they may be a bard, a simple merchant, a warrior, or even a philosopher. Is it just me or is the font too small to read? Really that must not be fun but hopefully this tread get some updates and better font sizing to help but if reading in quantity hunts idk. What you even do for that? The image up top looks fantastic!